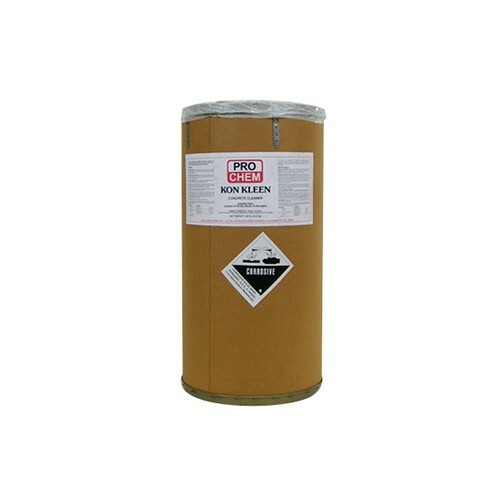 Kon Kleen | Pro Chem, Inc.
KON KLEEN is a powdered blend of alkali builders, detergents, emulsifiers and solvents that is effective in removing oil, dirt, grease and gasoline from concrete floors. It penetrates and emulsifies those hard to get soils. Ideal for use in garages, filling stations, bus terminals and other industrial areas. Concrete Floors: For best results, scrape off caked-on dirt and grease from floors before wetting down with water. Sprinkle KON KLEEN freely over entire area. Allow cleaner to remain on wet floor a few minutes, then scour with deck brush and rinse with clean water. Pressure Type Spray Systems: Add 3-5 pounds per 100 gallons of water in solution tank depending on pressure. High pressure units require less concentration than low pressure units. Manual Tire Cleaning: Add 2-4 oz. per gallon of water. Apply with brush in circular motions. Rinse washed areas with plenty of cold water.